But without the invention of the Universal Product Code (UPC) you would not have had the opportunity to scan your own goods. Supermarkets would still be individually pricing every can, bag and jar on every single shelf. History was made in June 1974 when a 10-pack of Wrigley’s Juicy Fruit chewing gum was scanned by a cashier in Ohio. Now, nearly everything we purchase has that familiar oblong of black lines or as we now call it, the barcode. The concept itself can be traced back to the early 1930s. Store holders realised they needed some way of controlling the hundreds of products on their shelves. It wasn’t until 1948 that Bernard Silver, a graduate student, overheard a conversation in the halls of Philadelphia's Drexel Institute of Technology. The president of a food chain was pleading with one of the deans to undertake research on capturing product information automatically at checkout. Although the request was refused, the idea caught his imagination. Together with his friend Norman Woodland, the pair developed and patented the invention in 1949. The equipment to make the system was cumbersome and not used much at first. Then in the 1960s a similar concept was used to identify freight cars in the rail industry. Lasers became more affordable and more portable in the late 1960s. Bar code systems were installed at the General Motors factory in Pontiac and the General Trading Company in Carlsbad. Further adapted for the grocery industry in the 1970s it was predicted that the use of such systems could lead to a saving of over $150 million dollars per year. A variety of shapes were tried and tested, from bull’s eyes to stars. The gate like image that we now recognise was adopted as the Universal Product Code, on April 3, 1973. It transformed bar codes from a technological curiosity into a business juggernaut. 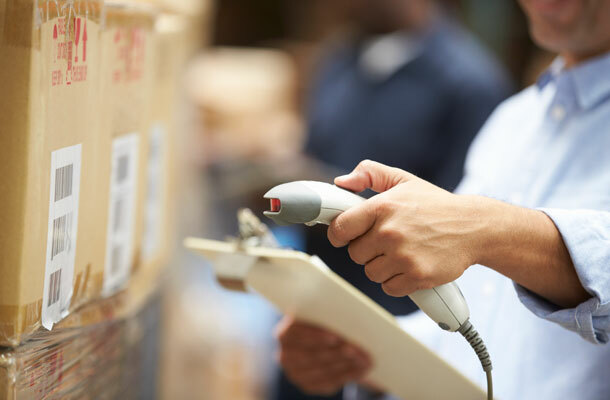 Holding basic information such as the manufactures details and the product information, the barcode is a major success. But what lies ahead? Originally developed for industrial uses the Quick Response code or QR has become a more common sight over recent years. Capable of storing up to 350 times the amount of information that can be stored on a typical barcode, its history goes back to 1994. Using a smart phone as a scanner, you can connect directly to websites. And marketers are putting this ability to some creative uses. A QR code in a magazine ad can send readers to a website to buy a product. Shoppers in a store are provided with more detailed information by QR codes on product labels. See the image above. Rather than strictly enforcing the patent, the inventors, Denso Wave, chose to create an international standard with the QR Code. It allows anyone to use or generate them without requiring a license or fee. Information about the patent and the use of the technology can be found on the Denso Wave internet site. Thanks for reading. Now why hasn’t my loaf of bread scanned properly...and yes, I have brought my own bag.